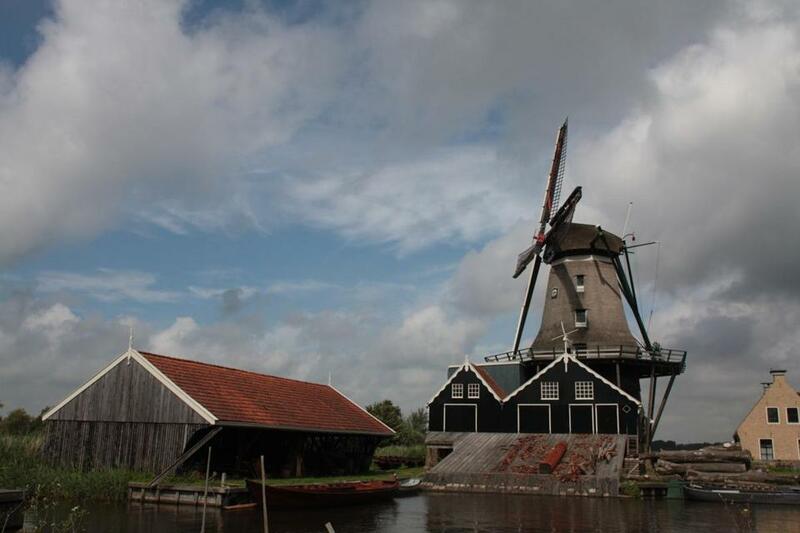 The windmill-operated sawmill, De Rat, in the town of IJlst, one of the stops along the Elfstedenroute, or 11-Cities Route, a bicycle tour in the Dutch province of Friesland. LEEUWARDEN, The Netherlands — The brilliant green fields sprinkled with black-and-white spotted cows along the highway leading to the capital of Friesland were not unexpected. This was, after all, the most northern province of the Netherlands, famous for its Frisian cattle and pastoral perspectives. But what was that giant bathtub-looking thing straddling the roadway? That, my wife, Selina, explained, pointing out the tops of boats I’d missed bobbing atop it, was an aqueduct. The province’s 11 viaducts carry waterways over roadways to enable boat traffic to sail through without stopping for drawbridges — though there are still plenty of those around, too. While it’s common knowledge that bicycles outnumber people in the Netherlands, here in Friesland, with almost as much water as dry land, anything that floats probably runs a close second. By the end of our five-day bicycle tour, I saw her point. We had stopped at more open drawbridges than traffic lights and had logged a good number of extra miles simply to get from one side of a waterway to the other, be it by bridge, a bike path under an aqueduct, or by ferry. But that was OK with us. By plotting a leisurely route, we had plenty of time to soak up the sights in cities, towns, fishing villages, and along the countryside. We followed a 150-mile loop bicycle route called the Elfstedenroute, or 11-Cities Route, inspired by the Elfstedentocht, a historic ice-skating race. The skating tour became official in 1890 and follows canals and other shallow waterways. It’s held over one day any year the water freezes solidly enough — which isn’t often. The last Elfstedentocht occurred in 1997, but the Dutch remain ever hopeful. Meanwhile, the 11-city premise grew to include cycling, in-line skating, driving and, of course, boating. Several people we encountered boasted about doing the organized Fietselfstedentocht, a spring event where some 15,000 of cyclists ride the course in one grueling day. Not to make excuses, but we were certainly not alone in our lollygagging. These days, many bicycle travel outfitters lead multiple-day rides along the route or offer self-guided options, supplying bikes, maps, luggage transportation, and lodging. Cycle path surfaces vary from paved to gravel and dirt, sometimes on the road, other times through the woods and over pastures. One trail took us along a dike with sheep that did not grasp the concept of “share the road.” Small signs mark the entire route, but weren’t always easy to spot, and we lost the route a few times. Because Selina and I live in the Netherlands, it was easy for us to bring our own bikes and stash the car. We also took the opportunity to try out Vrienden op de Fiets, or Friends on Bikes, a sort of budget-minded nonprofit Airbnb for human-powered travelers, whether biking, skating, hiking or rowing. Anyone can be a member (the website includes English) and lodging costs about $22 a person a night to stay in someone’s home, with breakfast. While our accommodations varied in type and location, rooms were always clean and breakfasts were filling. Most interactions with hosts felt less like cultural exchanges than friendly business transactions, but the experience might be different for international travelers. Though riders can pick up the Elfstedentocht anywhere along the route, it officially begins and ends in Leeuwarden, a city of about 96,000, known for its canals, historic center, and culture, which will be most prominently on display in 2018, when Leeuwarden and the entire province takes a turn as a European Cultural Capital. Leeuwarden’s most impressive artistic stop is the Fries Museum, first opened in 1880 and since 2013 housed in a striking contemporary building on one of the main squares. It includes contemporary and earlier art, along with historical displays, such as one on hometown girl Mata Hari, convicted of spying for the Germans in World War I and executed in France in 1917. As you walk from level to level, you can practice the province’s two languages, thanks to the stairwell wall covered with words in both Dutch and Frisian, the province’s official language and one of two recognized languages in the Netherlands. While Dutch is more commonly seen and spoken, many signs in Friesland are shown in both languages, and some parts of the region cling tightly to their own tongue. Frisian pride also is evident in its blue and white flag dotted with what look like red hearts but are meant to signify the leaves of water lilies. Our first day of cycling, to the small watery city of Sneek, included typical Frisian weather: a little sun mixed with clouds and rain, topped with 20 mph winds — the so-called “Dutch hills.” During our visit in early August, shifting winds throughout the week taunted us with more headwinds than tailwinds, and the skies remained mostly gray. The other “hills” we encountered throughout the flat province were “terpen,” artificial mounds built to protect residents from flooding before dikes were first constructed here in the 11th century. Some villages’ elevation changes are nearly imperceptible, while tiny Hogebeintum sits atop the Netherlands’ highest terp, measuring 29 feet tall. My personal Dutch guide clued me in about the fields in the middle of nowhere planted with lights on tall poles — they’re flooded in the winter for ice skating. Selina spied another kind of field as well, those designed for playing kaatsen, a traditional Frisian game related to American handball. We were hoping to encounter yet another Frisian sport — fierljeppen — a bit like pole vaulting, but over water-filled ditches. No such luck, but we saw signs for upcoming fierljeppen competitions. Other Frisian traditions were in high season, including races on skutsjes, the traditional Frisian flat-bottom sailing vessels, first used in the 1800s to transport peat. While we didn’t make it to any of the competitions, every day we saw plenty of people boating and sailing, many gliding near us while we cycled along bike paths a few feet away. My favorite stops were the towns of fewer than 1,000 people, including Sloten, whose highlights are a drawbridge and windmill; and Stavoren, a historical fishing village on the massive Ĳsselmeer, or Lake Ijssel. Before reaching town, we watched more than 100 kite surfers compete for space in a curve of the lake. In canal-lined Hindeloopen, a former fishing village turned adorable tourist town, we visited the Bootsma family business. There, family members paint swirly decorations on furniture in a local tradition similar to early American furniture, serve Dutch pancakes (a bit like pizza) in their restaurant, and operate the must-see Schaatsmuseum, or Skating Museum, a cheery, cluttered compendium of all things ice skating. Other quirky museum stops included the Jopie Huisman Museum in Workum, which celebrates the native son and national hero, whose 20th-century paintings depict local life; and the Eise Eisinga Planetarium, housed in a canal-side house in Franeker. Eisinga’s former living room ceiling holds the world’s oldest functioning planetarium – an accurately moving clockwork model of the solar system he built between 1774 and 1781. Our final day of cycling, from Dokkum back to Leeuwarden along a barge canal flanked by graceful reeds, might have topped them all for scenery had the wind and rain not clouded the view and our moods. We pushed through, and headed straight to the café at the Fries Museum to dry off, warm up, and fortify with “suikerbrood,” a standard Frisian sweet akin to a cinnamon bun. Driving south along a four-lane highway on our way home a few hours later, I couldn’t believe the cause of the holdup we encountered – a drawbridge was up. A drawbridge on a high-speed roadway? Selina told me that an aqueduct is on the region’s wish list, but more funding was needed. Until then, the cars would just have to wait. At-home hosting service organized by nonprofit group, open to all members ($9 a year). Website includes English. Several outfitters arrange self-guided tours of the 150-mile loop bicycle route called the Elfstedentocht, or Eleven Cities Tour, including tripsite.com (8 days for $825) and Van Gogh Tours (www.vangoghtours.com), 8 days for $850. Bikes also can be rented in several cities along the tour. Diane Daniel can be contacted at diane@bydianedaniel.com.